In-vitro tests and analyses are of fundamental importance for investigating biological mechanisms in cells and bio-molecules. The controlled application of forces to activate specific bio-pathways and investigate their effects, mimicking the role of the cellular environment, is becoming a prominent approach in this field. Methods based on the remote manipulation of magnetic beads are receiving great attention because magnetic fields are not screened by biological or culture media and because they do not involve relevant energy dissipation, which could eventually damage the cell structure. In this project, magnetic domain wall tweezers  in combination with magnetic nanoparticles are exploited to apply controlled mechanical forces  to the cellular membrane. Mechanical forces owing from chromosome dynamics or plasma membrane stress convey to the nuclear envelope activating ATR. ATR is a PI3 kinase and is connect to the DNA damage response , protecting the integrity of replicating chromosomes, preventing fragile site expression and aberrant condensation events. ATR coordinates nuclear envelope plasticity with chromatin and cytoskeleton dynamics to counteract aberrant chromatin dynamics at the nuclear envelopment. ATR activation will be studied using quantitative approaches to assess the mechanical forces required. The project aims at: 1) implementing nanotechnology-based tools to measure apply controlled localized mechanical forces to the cell membrane and to internal cellular compartments to activate ATR; 2) characterizing mechanisms and factors in the ATR-mediated mechanical response; 3) studying how the ATR-mechanical response affects nuclear plasticity and cytoskeleton dynamics. 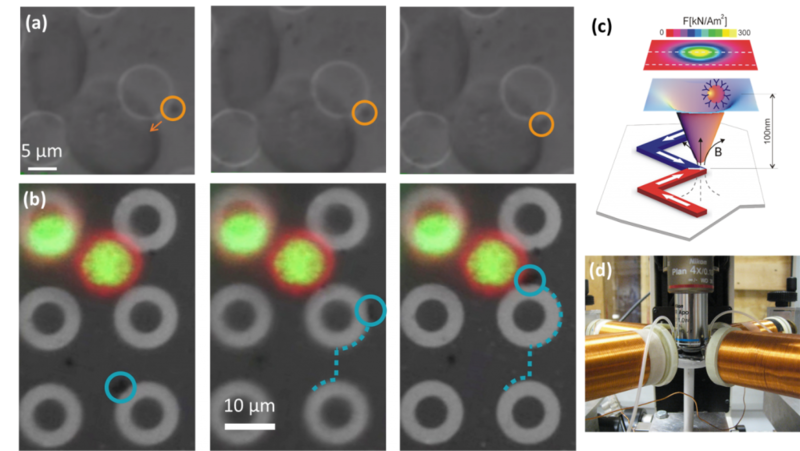 (a) Frames from a video showing the manipulation of a single MNP over a circular magnetic conduit with 10 μm diameter in proximity of a mammalian murine cell, induced by rotating in plane a magnetic field of 300 Oe; (b) frames showing the stimulation of HeLa cells; the nucleus is green florescence, while actin is red fluorescence; (c) Sketch of the potential energy well capturing a magnetic nanoparticle on top of a domain wall in a magnetic conduit; (d) experimental setup: 60x immersion objective and 4-pole electromagnets. M. Donolato, P. Vavassori, M. Gobbi, M. Deryabina, M. F. Hansen, V. Metlushko, B. Ilic, M. Cantoni, D. Petti, S. Brivio, and R. Bertacco, “On-Chip Manipulation of Protein-Coated Magnetic Beads via Domain-Wall Conduits,” Advanced Materials, vol. 22, iss. 24, p. 2706–2710, 2010. M. Monticelli, E. Albisetti, D. Petti, D. V. Conca, M. Falcone, P. P. Sharma, and R. Bertacco, “Towards an on-chip platform for the controlled application of forces via magnetic particles: A novel device for mechanobiology,” Journal of Applied Physics, vol. 117, iss. 17, 2015. A. Kumar, M. Mazzanti, M. Mistrik, M. Kosar, G. Beznoussenko, A. Mironov, M. Garrè, D. Parazzoli, G. V. Shivashankar, G. Scita, J. Bartek, and M. Foiani, “ATR Mediates a Checkpoint at the Nuclear Envelope in Response to Mechanical Stress,” Cell, vol. 158, iss. 3, p. 633–646.